Taking a photo of this quilt in its entirety, that is. This is the best I can do, although to be fair all you are really missing is a good view of the mahoosiveness. The wonderful thing about this pattern is that you don’t lose any of the actual design in the bits that hang over the edge of the bed. That Aneela is a genius! I am so happy with how this turned out. I spent literally every waking hour this weekend stitching – my hands ache in an “I achieved something” kind of way. It feels good. Now if only I had some scaffolding or something that I could hang the bugger off I would show you the quilting from the back. I used regular white quilting thread (not perle cotton, for a change) and actually managed to get fairly small, even stitches. They look really nice against the dark pink backing. It’s bound in dark blue (Kona Windsor, I think) and I used this fantastic method for the binding. I know it sounds crazy gluing everything together, but it really works and the glue completely disappeared in the wash. I even joined the strips on the diagonal, which I never do normally because I always sew them together in the wrong direction. Gluing them first makes it idiot proof and holds everything together really well. Hey hey, now I'm realizing you got married only a few months after I did!! 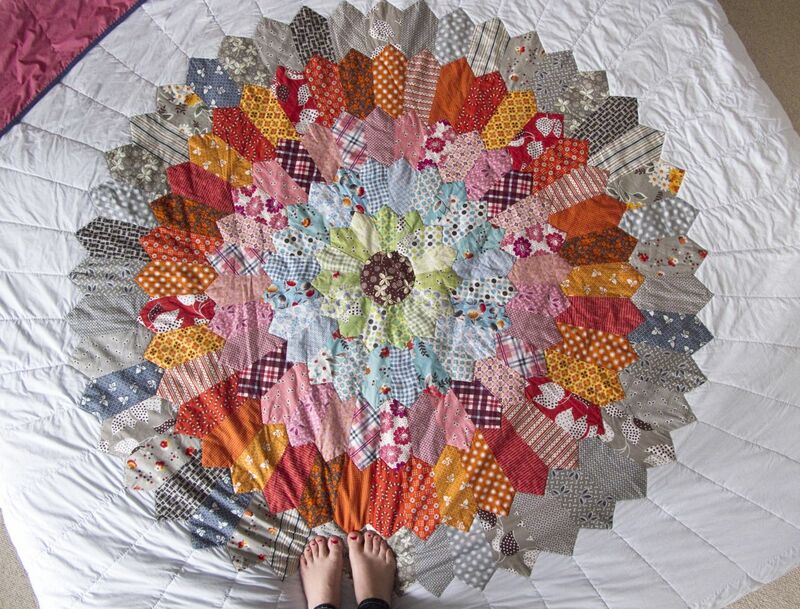 Ok, and now I want to MAKE THIS QUILT, o em to the g. I feel so out of it. Like, it's making me realize how much cool stuff happened BEFORE I got into modern quilting and I feel as though I must READ ALL THE OLD POSTS on every blog ever. Oh dear.